Infinit-I Workforce Solutions is the expert in the digital enhancement of employee learning and business productivity. A learning management system (LMS) is an employee training software that digitally transforms your company training and communication. Our specialized LMS for business improves your company’s administrative efficiencies while maximizing your business outcomes. Why do I need a learning management system? Do your employees have access to a single source for training, policies, and announcements? If you had to go to court tomorrow, do your training records demonstrate an ongoing culture of training and safety? Can you easily generate training reports by individual employee, by groups of employees, by location or by job function? If you answered “No” to one or more of these questions, then your company will significantly benefit from implementing a learning management system. Infinit-I training modules are an average of three to seven minutes long, which improves your employees ability to comprehend and remember the material. Each Infinit-I client receives a white labeled website that displays only their company logo and colors. 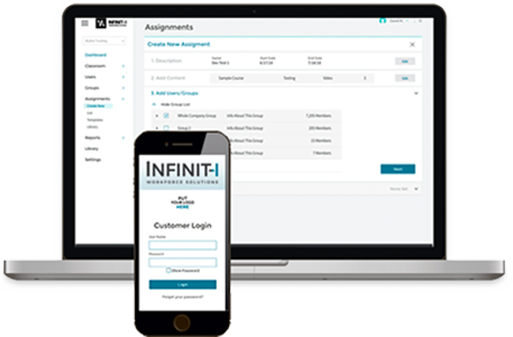 Clients of Infinit-I Workforce Solutions receive unlimited access to over 800 training modules and videos from our video content library. Documented training protects your business in a court of law. Infinit-I’s advanced reporting can be customized and automated. Utilize your centralized training system for your entire company communication: post company updates, employee achievements, corporate newsletters, company calendar, and more. Our mission is to become a trusted extension of your business who strengthens your company/employee relations, while progressively impacting your bottom line. Each client of Infinit-I is assigned a Dedicated Client Success Representative that trains your staff in how to implement our system, and constantly reviews your account for more ways to increase the ROI for your business. Learn more about the expertise of our Client Success team. Who in your company will benefit from employee training software? Presidents & CEOs rest easier knowing their business is protected from legal and compliance pitfalls. HR Directors enjoy faster and more effective ways of onboarding new hires. Plus, they reap the benefits of automating annual training. Risk Managers enjoy knowing that plans are in place to reduce risk that could impact the company’s profitability. Safety Managers appreciate being able to ensure everyone in the company complies with health and safety laws. Employees benefit from having one place to receive training, newsletters, announcements, policies, procedures, and other communication. Ready to digitally transform your employee training with Infiniti-I? Hundreds of companies utilizing our powerful employee training program have reported increased revenue, streamlined communication, and reduced their training costs by an average of 50 – 70% or more. Request a personal demo of Infinit-I Workforce Solutions today, or experience the power of our system in-person at an upcoming Engage Event seminar. SRT utilized the Infinit-I Workforce Solutions learning management system to deliver customized training about SRT’s billing processes. Their digitally transformed online training reduced billing errors and un-billed charges, while increasing the collection of past due receivables.